This chalet dated back to 1789 is a real jewel and combines harmonically its historic exterior with modern comfort. There is a fire place and free WiFi. The chalet was mainly built in stone – the traditional material of the region – and was converted with an eye for details. Depending on snow and weather conditions you can ski directly from the ski area to the chalet (no marked or prepared ski run, use at own risk). 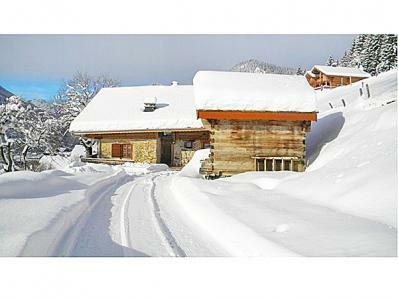 The chalet is situated approx. 600 m away from the 4seated express chair lift Barbossine, your entrance to the ski area Portes du Soleil. This chair lift is the connection to the Swiss ski spots Torgon and Morgins. Smaller shops and restaurants approx. 600 m away. Distance to the ski bus stop (connection to the village centre and ski area Linga) ~300 m. Distance to the lively village center of Châtel (with its restaurants, bars, shopping possibilities, two ice-skating rinks, après-ski-bars, new aquatic centre (wellness and fitness areas), walks on horse-drawn carriage) approx. 1.5 km. Childcare from two years on. 650 km of slopes, 211 ski-lifts. Altitude of the Chalet 1,300 m. Châtel is located in the heart of the Franco-Swiss ski domain called Portes du Soleil – altitude up to 2,400 m – that offers attractive slopes around Avoriaz, Les Lindarets and Les Crosets/Switzerland. New ski link in Châtel between Linga and Super-Châtel via two chairlifts and slopes. Châtel-Linga is an ideal starting point to enter the ski area. This ski area has ski slopes for everybody (beginners as well as advanced skiers). Snowboarders enjoy the Smooth Park, Boardercross or the FFS-Halfpipe. In Châtel are a lot of other options for winter activities: e.g. snowshoes trails, ice diving and ice skating.